The Israeli Air Force launched a strike on a militant cell, who had arrived from Syria, after they were attempting to plant a bomb in the occupied Golan Heights. Reports say that up to four people have been killed in the operation. The military did not confirm or deny any casualties, but local media said up to four people had died. 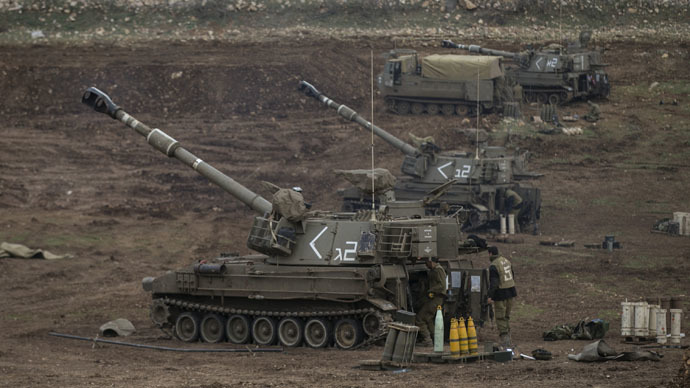 The Haaretz newspaper reported that three militants were killed and it was likely that the fourth one had been hit. It was also confirmed that the explosive device was not activated. Israeli Prime Minister Benjamin Netanyahu praised the troops’ quick response: “Any attempt to harm our soldiers or our citizens will be met with a decisive response like tonight’s IDF operation that prevented a terror attack. I commend the vigilant IDF soldiers that acted quickly and accurately,” he said. No one immediately claimed responsibility for the attempted attack. Israel seized part of the Golan Heights from Syria during the 1967 Six-Day War. Damascus tried to unsuccessfully retake the Golan Heights during the 1973 Yom Kippur War. The two countries signed an armistice in 1974 and a UN observer force has been in place on the ceasefire line ever since. Both countries are still technically in a state of war. Incidents similar to the Sunday attack are not uncommon on the Israeli side of the Golan Heights border. In March, Israeli soldiers shot at Hezbollah fighters who were suspected on trying to plant a bomb at a similar spot. There has been a lot of violent activity at the border, as Syrian anti-government rebels, including the extremist Al-Nursa Front, have been making their presence known on the Syrian side of the boundary. One of the biggest incidents involved the capture of 43 United Nations peacekeepers by armed Islamist forces in the Golan Heights. Militants linked to the Islamic State have been trying to seize control of the border crossing. The Syrian Civil War, which started in 2011, has left the country in a state of turmoil and has at times, spilled over into Israeli territory. Israel’s Air Force shot down a Syrian fighter jet over the Golan Heights in September, while in August, Israel took down a drone that had crossed over from Syria. Israel has not been a passive bystander in the Syrian conflict. UN observers at the Israeli-Syrian border reported back in December that Israeli security forces have treated wounded Syrian rebels and have possibly supplied them with arms for more than a year. In a series of reports to the UN Security Council by the United Nations Disengagement Observer Force (UNDOF), there have been a number of documented instances (from March 2013 to December 2014) of the IDF engaging with “armed members of the opposition” on the Israeli-Syrian border in the Golan Heights. In January, Israeli warplanes struck several targets in Syria. The IDF said this was in response to Hezbollah rockets being fired into the Israeli occupied region.